Hvar is a city and port on the island of Hvar, part of Split-Dalmatia County, the town is located in a small bay on the south coast of the island of Hvar, towards the western end. The surrounding land is hillside, rising steeply from the Adriatic Sea. The rocks in the area are porous, mainly limestone and dolomite, so ground water is scarce. However there is some agriculture where the terrain is sufficiently accessible, and can be irrigated, such as olive groves, vineyards, lavender, rosemary.The municipality has a population of 4,138 (2001) while the city itself is inhabited by 3,672 people, making it the largest settlement on the island of Hvar. The earliest known settlement on the site of today’s Hvar town was Illyrian, lying on the hill slopes to the north side of the town square, which was then a small bay that came up to where the cathedral now stands. On the site of the present Spanish Fortress stood a hillfort, the importance of which can be seen in the pottery from the site, indicating long distance trade from the eighth century B.C. onwards. During the 7th–8th centuries, the Slavs arrived on the island. At this time, life on the coast was not safe due to raiding pirates, and the inhabitants moved inland. By the Medieval period, the population had gathered in villages well away from the coast for safety. Following this unsettled period, the islanders asked the Venetian Empire for protection (1278). As part of the agreement, the southern settlement of Hvar was expanded and fortified as a safe base for the Venetian fleet. As the new administrative centre, the town assumed the name of Hvar, and the ancient Greek town became known as Stari Grad (literally Old Town). Hvar became the centre of the independent commune government, the residence of the prince, and the base of the new diocese (consisting of Hvar, and the neighbouring islands of Brač, and Vis). The Venetians commissioned the construction of a new fortress, town walls, public buildings, and cultural life thrived as prosperity grew. Hvar is the site of one of the oldest surviving theatres in Europe, opened in 1612. 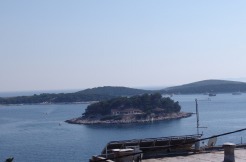 In 1776, the Venetians moved their naval base to the mainland, and the town of Hvar went into decline. After a brief period under the French Empire, Hvar came under the Austrian Habsburg Empire in the early part of the 19th century, this turned out as a period of exceptional economic growth and cultural life for the town. In 1868, “The Hygienic Association of Hvar” was founded, to promote the development of tourist services, one of the old tourist societies in Europe. These days tourism thrives in Hvar, the city is a popular port of call for yachts sailing around the Adriatic, especially in the summer months. The island promotes itself as “the sunniest spot in Europe”, with over 2715 hours of sunlight in an average year, and with hot summers and mild winters, the holiday season is extending year on year taking advantage of this great climate. With warm waters, the sea typically 24/27 degrees Celsius in the summer months, and a personality and warmth of the local people beyond compare, Hvar goes from strength to strength.